Hua Hin, a seaside town just a few hours by car, train, or bus from Bangkok, is home to some of the most popular beaches in Thailand, which are nestled on the Gulf of Thailand in the southern Thai province of Prachuap Khiri Khan. Here, you can expect a long, flat stretch of sand that slopes gently into the ocean, surrounded by a small town with plenty of upscale hotels, resorts, and guest houses as well as places to drink and eat fresh seafood. In its former life, Hua Hin was a local fishing village, but its sugar-soft sand and crystalline waters quickly drew the attention of Bangkok residents and transformed the village into a resort town. In the 1920s, the Thai royal family even built their summer "cottages" (more like mansions) here. Today, the area is known for its world-class beaches and kite-surfing spots. Hua Hin is very easy and affordable to get to from Bangkok. There are daily trains from Bangkok's Hua Lumpong Station that take about three hours, and there are also multiple government buses (small, mini-busses) that leave every day from Bangkok's Southern Bus Terminal and from Victory Monument. Once you get there, Hua Hin proper is small enough that you won't need anything more than your own feet to get around. If you want to venture to further beaches or to surrounding attractions, though, consider renting a car or motorbike. However, before you get behind the wheel, make sure you understand the rules of the road since driving in Thailand is not as organized as some western countries. Although the most popular attraction in Hua Hin is its beach of the same name, there are a number of other tourist attractions and beaches near this seaside resort town. Whether you want to spend some time with wild monkeys at the temple on Chopsticks Hill or you want to explore the trails of Khao Sam Roi Yot National Park, there are plenty of things to do near Hua Hin. Hau Hin Beach: Lined with resorts, restaurants, bars, and clubs, this cityside beach may be a bit crowded during the daytime, but it's great for an evening date. 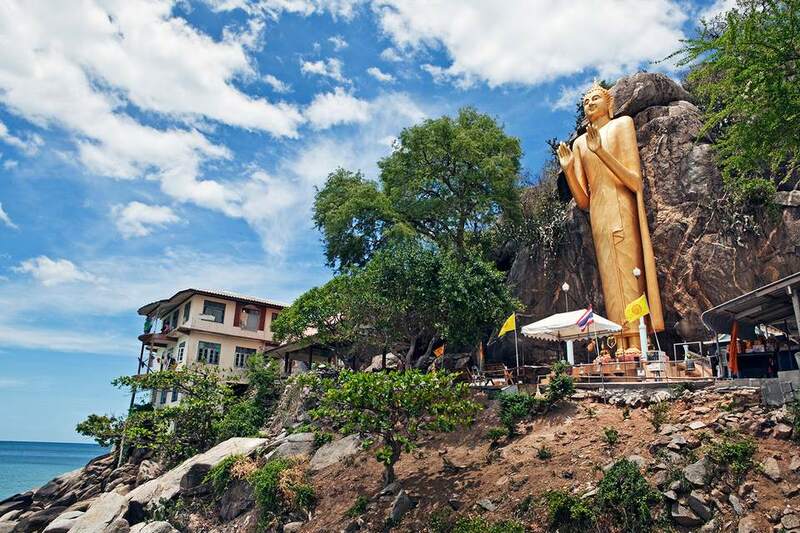 Chopsticks Hill: Overlooking Hua Hin beach, this hill is home to the Khao Takiab temple and a pack of wild monkeys known for stealing from people's bags and pockets. You can get here using a tuk-tuk or songthaew and should plan to stay for about an hour or two. Suan Son Pradipat Beach: Located about eight kilometers south of Huan Hin, Sea Pine Tree Garden Beach (as its known in English) is significantly less crowded. While there may not be any beach vendors here, there are a number of great restaurants on the northern end of the beach. Khao Sam Roi Yot National Park: Home to Phraya Nakhon Cave, several beaches, hiking trails, and unparalleled views of the region. Pranburi: Just 30 kilometers south of Hua Hin. Pranburi is home to Nom Sao and Pranburi beaches, both of which are great for a relaxing, semi-private day on the sand. March through May is considered the hot season, with temperatures sometimes climbing up to triple digits, and June through October is considered the rainy season, which may put a damper on your beach plans. As a result, the best time to visit is during the high season from November through February when the weather is warm and dry—perfect for a day at the beach. Hua Hin attracts lots of local tourists and lots of Europeans year round, and during the high season, restaurants, beaches, and local attractions can get quite crowded. However, due to this mixture of common tourists, expect to find as many German and Italian restaurants as there are Thai ones. If you're not lounging on the beach or your resort's pool, consider horseback riding. In Hua Hin, there are always horses available for rent and guides who will lead you if you are not an experienced rider. You can also hike up the nearby mountains or travel a little farther to one of the country's prettiest national parks, Khao Sam Roi Yot. From five-star international chains to inexpensive guesthouses, Hua Hin is full of amazing accommodations. During high season—between November and February—make sure to make reservations in advance so you can have a better selection of places to stay. The Hua Hin Marriott Resort & Spa is a great option for those looking to book on Starwood points, and the V Villas Hua Hin MGallery by Sofitel offers sprawling suites and villas, some of which have their own private plunge pools. Evason Hua Hin, a Six Senses resort, is an eco-friendly luxury getaway set on 20 beachfront acres of tropical gardens. Additionally, with the rise of international tourism, many smaller establishments have opened their doors to visitors. Be sure to browse all the best options for accommodations in Hua Hin on sites like TripAdvisor before you book your reservations.